We hope this readers group guide gets the wheels turning at your next book club meeting! It’s publication week for the new paperback edition of Ghost Riders, by New York Times bestseller and Southern favorite Sharyn McCrumb. This new edition has a foreword by North Carolina Civil War historian Michael Hardy. Ghost Riders is “a compelling Civil War tale with a chilling twist” (Library Journal), primarily narrated by historical figures Zebulon Vance (colonel of the 26th North Carolina and later Confederate governor of North Carolina) and Malinda Blalock (who disguised herself as a boy and went with her husband when he was forced to enlist in the Confederate army). With few people left to trust, the Blalocks head for high ground to avoid the county militia and soon become hard-riding, deadly outlaws. Rattler, an old mountain root doctor who has the sight, speaks for the present; he fears that the zeal of a local Wake County, Tennessee, Civil War reenactors’ group will awaken the restless spirits of the real soldiers still wandering the mountains. Ghost Riders captures the horrors of a war that tore families apart, turned neighbors into enemies, and left the survivors bitter long after the fighting was officially over. To celebrate publication week of this stunning novel, we’re lucky enough to share a guest blog post from the author herself. As a serious writer of historical fiction, Sharyn McCrumb goes above and beyond to get the facts right in her novels. Here she is on her philosophy for writing historical fiction. Enjoy! I believe that historical novels (if the authors are good writers, if they research well, and if they understand their subject matter) can be as valid and sometimes more important than the work of an accredited historian. The difference between “truth” and “fiction” is often spurious. The Iliad is listed in fiction, but in the 1890’s Heinrich Schliemann bought a shovel, went to the coast of Turkey, and found Troy. On the other hand, Mein Kampf is shelved under nonfiction. The Blalocks, my main characters in Ghost Riders, were real people, and I researched them for years, but one so-called nonfiction book about them was completely inaccurate, including faked sources and invented footnote citations. Nonfiction does not mean true. I think my job as a historical novelist is to make people care — to feel the events, rather than just to know the facts in a clinical sense. I do exactly the same research that any historian would do, but then I have to go one step further and bring all that research to life, giving it emotional weight and sensory illumination. Historians draw a picture of a battle. Historical novelists put you in it. Historical fiction begins when something cannot be verified, but I take my best guess based on thorough research. When a conversation took place, in the pre-tape recorder-era, and we have only the gist of it, I have to produce that conversation in dialogue, so I take my best guess — often after reading speeches made by the person in question, so that I can approximate their speech patterns. Once for Ghost Riders, I took a fragment of something North Carolina Governor Zebulon Vance really said, and I elaborated on it to make it into a longer scene for my novel. I sent the finished scene to a Zebulon Vance scholar, who was unable to tell where the real Vance left off and my embellishment began. I had got his voice right. In Ghost Riders, there is a scene in which I have Zebulon Vance reacting with rage to the report of the Sodom Laurel Massacre in his home county. I know he did react with rage to that news. Memoirs of that era and the governor’s papers in the N.C. archives all say so. But since I don’t know word-for-word exactly what he said when he heard the news, I was “inventing” words to show — dramatize — his response. A nonfiction historian would not do that. I did not change the facts, though; I simply dramatized them. While historians strive to be objective, I can take sides. Thus I have to know as much as I can to choose a side, and in creating a character I have to know how that person would think and feel and what other things in his era would influence his feelings — even to the point of knowing what songs might be in his head. Because I don’t have to be objective, I can make the reader experience an event through the eyes of one partisan character, and by doing so I can make the reader care deeply about the event. I also try to experience what I can to find out what the physical sensations were. I have dressed in a Civil War uniform and fired a muzzle loader. I have sat in Tennessee’s electric chair. I have done laps in a race car at Lowe’s Motor Speedway. I visit every major place I write about. I think there’s more to history than reading papers in the archives. Sharyn McCrumb is an award-winning Southern writer, best known for her Appalachian “Ballad” novels, including the New York Times bestsellers The Ballad of Frankie Silver and She Walks These Hills, and for St. Dale, winner of a Library of Virginia Award and featured at the National Festival of the Book. The Ballad of Tom Dooley, (Thomas Dunne, 2011), a New York Times bestseller, tells the true story behind the celebrated folk song. The Library of Virginia has named Sharyn McCrumb a Virginia Woman of History for Achievement in Literature. A new paperback edition of her Audie Award-winning Civil War novel Ghost Riders has been published by John F. Blair, Publisher. Check the blog tomorrow — we’ll post an exclusive readers’ group guide for this novel! In the meantime, be sure to look for Sharyn’s events in your area. Gasp! I can’t tell you how shocked (SHOCKED!) we at Blair are. Melinda Rainey Thompson, author of the new I’ve Had It Up to Here with Teenagers, who has been guarding her secret recipe from us for years, has now shared with the world in a guest blog post on The SITS Girls. We’re simply speechless. It’s a very versatile recipe. I’m a writer; I once mailed this pound cake to North Carolina to thank an editor who liked my first book. Even after being jostled by the post office, this cake got rave reviews. My kids expect it to appear on the sideboard at every family occasion. They think the regular consumption of this cake is their God-given, constitutionally protected birthright. I’ve left my mark on earth with this pound cake, and I’m going to tell you exactly how to make it. I really am. I’m not going to leave out any ingredients, like some Southern women I know, who do that to ensure that your pound cake never quite lives up to theirs. I’m a bigger person than that. I feel rather virtuous as I’m typing this, as if I’ve just made a generous donation to a worthy cause. I promise you one thing: When you try it, you are going to want to kiss me right on the mouth. Here’s what you need to do: Put three cups of sugar, one bar (eight ounces) of cream cheese, and three sticks plus two tablespoons REAL butter (no cheating, you’ll ruin my recipe) in a mixer. If you have time, let the butter and cheese come to room temperature first. If you don’t, microwave them to soften them up. Mix. Gradually alternate adding three cups of plain flour and six large eggs, slightly beaten, until the mixture is a bit thicker than pancake batter. (This is not quantum physics; don’t overthink these instructions.) I use a forty-something-year-old Kitchen Aid mixer I bought at a yard sale. It works fine. Finally, add one teaspoon of each of the following flavorings: (They’re expensive to buy the first time, but then you’ll have them on hand for several more cakes; you will be asked to bake more. Trust me.) Vanilla, (real, no imitations, Southerners do not like fake flowers, butter, or anything else.) almond, brandy, sherry (You can use cooking-grade liquors. ), and coconut. If you don’t like one of these flavorings, you can double up on something else. Feel free to adjust to your family’s taste. This isn’t holy writ. But don’t use fake anything—no matter what. Forget about those low-fat substitutions you’re considering. This is a CAKE, for heaven’s sake. Mix in the flavorings. Pour the batter into one greased Bundt pan or two loaf pans (If you’d like smaller loaves which are easier to share and slice perfectly for strawberry shortcake, choose the loaf pans. Beat a pint of heaving whipping cream with a little sugar if you’re so inclined, and slice up the berries. Don’t use that canned whipped cream that kids like to squirt in their mouths. Remember: Fake is BAD. Real is GOOD.). Do not preheat your oven. (I know, I know. It’s unusual.) Bake at 300 degrees for about one hour and ten minutes. DO NOT OVERBAKE THIS POUND CAKE! You want “sad streaks” which make it so moist and delicious your eyes roll back in your head when you taste it. Ovens vary, of course. Mine came over on the ark, so work with what you have, and check to see how that cake is coming along. It’s done when a toothpick comes out of the middle cleanly, but this is a judgment call. I like my pound cakes a bit underdone. That’s one of my secrets. When you remove the cake from the oven, let it cool in the pan on a wire rack for five or ten minutes. While the cake is cooling, melt one cup of sugar in a half cup of water in a boiler on the stove. Remove the pan from heat, and add one teaspoon of each flavoring. Slide a sharp knife around the edges of the cake pan before inverting it to help release the cake. Turn it out quickly onto a plate and then immediately flip it right side up on to the platter you are going to serve it on. Feel free to hold your breath and pray. It can’t hurt. Allow the cake to rest for a few minutes, and then spoon the glaze over it. Leave it uncovered for a few hours until the liquid has been absorbed. This cake is finicky, but it’s worth the trouble. Because it is so deliciously moist, it sometimes sticks to the pan. It takes practice to get it just right. Do not worry if your pound cake falls apart or sticks. That is how God urges you to make trifle. I promise you one thing: People will gladly scrape this pound cake up with a spoon. It’s that good. Melinda Rainey Thompson is an award-winning author of three books: Southern Women Aging Gracefully, The SWAG Life, and I Love You—Now Hush. Her newest release, I’ve Had It Up To Here With Teenagers, will be published in April 2012. Like her on Facebook and visit her blog when you need a laugh. On Twitter, she is mrtswag. Melinda responds to email, tweets, Facebook messages, smoke signals, and more. 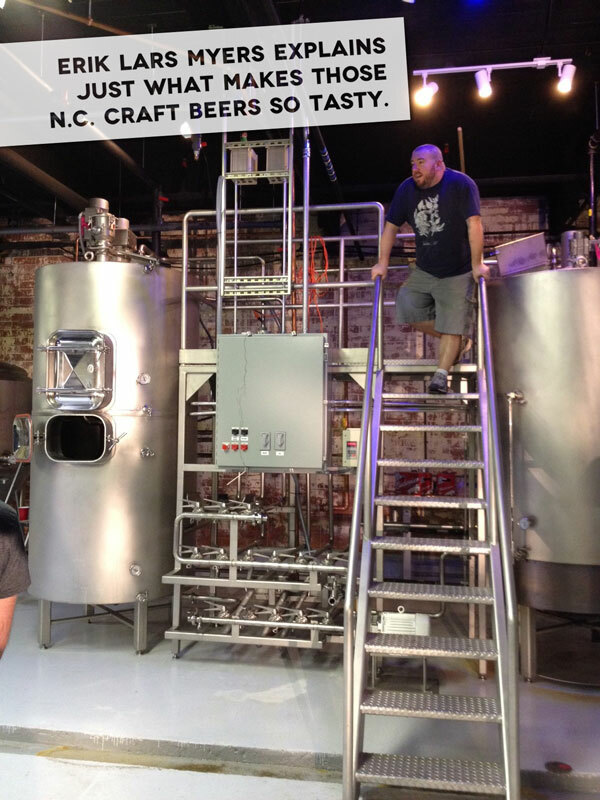 Remember when I promised you something special for North Carolina Craft Beer and Breweries, by Erik Lars Myers? Here it is, Erik’s very own book trailer! Enjoy! It was such a pleasure to work with Erik and his friends, particularly our videographer, to create this. North Carolina has the cutting edge beer culture in the country right now, and we love exploring it. “No matter where you live, you’ve got great beer just around the corner,” says Chris Sheilds, Assistant Brewer at Mystery Brewing Company. With more than 50 breweries across the state, how right you are, Chris! So what do you think? Does this inspire you tap into local brew? If you haven’t heard the news yet, we at Blair are thrilled to be publishing North Carolina Craft Beer & Breweries, by craft brewer Erik Lars Myers, coming out this April. The book profiles nearly 50 craft brewpubs and breweries across the state and offers a look into the history that has created a vibrant N.C. beer culture. If you’re a fan of Foothills, Natty Greene’s, or any of the many craft brewers in our area, you’ve got to check out this book. 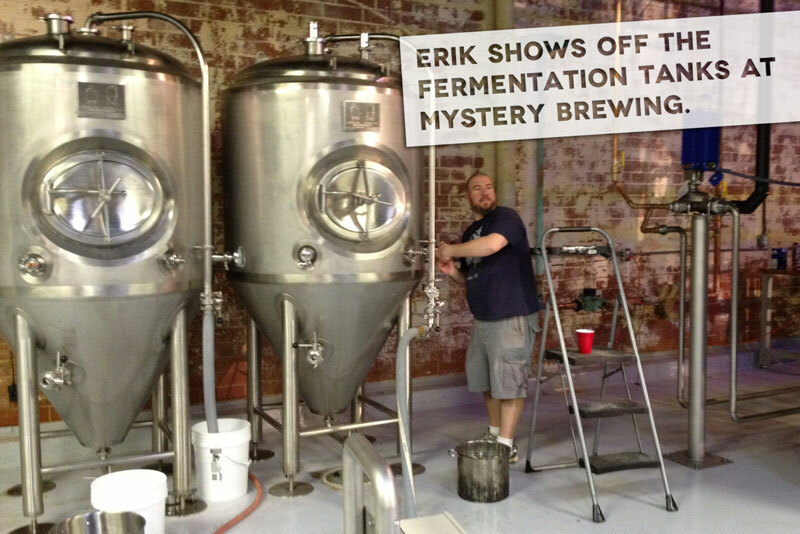 Erik invited us to a private get-together this past weekend to celebrate his new brewery, Mystery Brewing in Hillsborough, N.C. We were lucky enough to take a private tour of the facilities and schmooze with some of the greats of N.C. craft beer. Erik graciously let us sample two of his first official brews. I’m partial to Gentlemen’s Preference, a blonde ale, but our VP of sales Angela preferred Queen Anne’s Revenge, an English-style IPA. If you get to try Six Impossible Things, an oatmeal stout with notes of cocoa and coffee, please let us know how it is! We’re dying to try that. Ready for your own tour of the brewery? 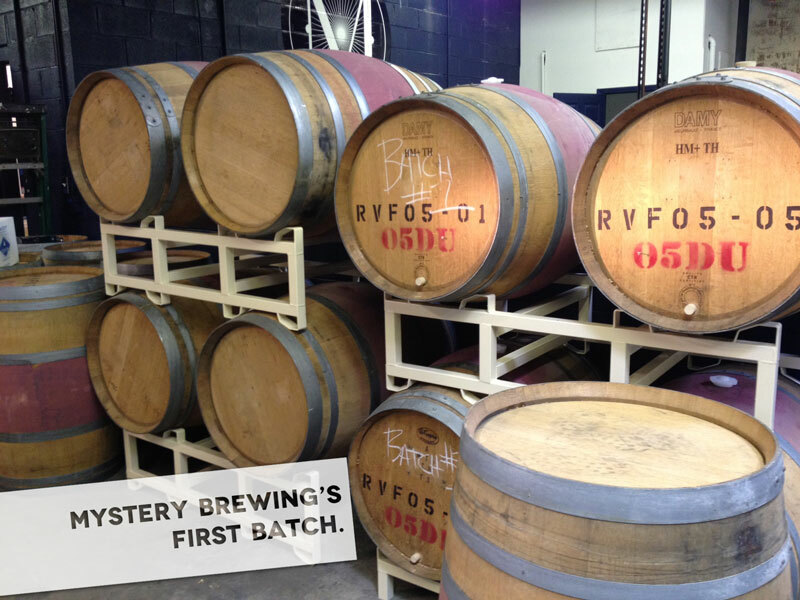 Mystery Brewing will host a weeklong grand unveiling event that is open to the public at the end of the month. The official grand opening will take place February 29 at 7 p.m., including hourly tours and a ribbon-cutting ceremony by Hillsborough Mayor Tom Stevens. The rest of the week is full of events, from movie night and live music at the brewery to Q&A sessions at local bars. It’s bound to be a good time, and there will be great beer! (Seriously, you have to try the Gentlemen’s Preference). If you can’t make it to Hillsborough for the festivities, don’t sweat it. Erik will travel across the state in April and May, making stops at brewpubs and bottle shops to sign books and talk about what makes North Carolina craft beer so great. We’ll post details once we finalize his book tour. We’ve got something special in store for this book, so check the blog next week to find out more! As part of the silent auction, Cafe Luna in Raleigh and Governor Jim Hunt are offering an exclusive lunch for eight with the former governor. If you’ve never met the governor before, he’s one of the most fascinating characters in recent North Carolina history, so we hope you’ll make your bids on him! The lucky winners will also receive copies of Jim Hunt: A Biography, by Gary Pearce, from Blair. Enjoy! As one of Jim Hunt’s closest political advisers, Gary Pearce was in a unique position to observe the career of North Carolina’s longest-serving governor. In this authorized biography, Pearce draws from his own observations and experience as well as over 30 interviews with Governor Hunt and more than 50 interviews with friends, family, staffers, political allies, and opponents. The book covers Hunt’s rise to prominence and his four successful gubernatorial campaigns. It also provides a front-row account of the bitter battle between Hunt and Jesse Helms for the U.S. Senate in 1984. Pearce explains how Hunt was able to come back from that devastating defeat and win two more terms as governor. In his final eight years of office, Hunt pursued progressive goals in a conservative state, became widely known for his initiatives in education, and played an important role in leading North Carolina from being a poor, rural state dependent on tobacco and textiles to becoming a center for high finance and high-tech industry. What do you know about Gullah? So how did you do on yesterday’s quiz? Spoiler alert: below are the answers. Look at yesterday’s post if still want to take the quiz before seeing the answers. 1.What language do the Gullah still speak today? The Gullah language is a Creole blend of Elizabethan English and native tongues with its own grammar and vocabulary that originated on the coast of Africa and came across the Atlantic on slave ships. As many as 20 percent of the words are West African, and many more were made understandable because of the fact that Gullah is a language of cadence, accents, and intonations.Today, more than 300,000 Gullah-speaking people live on the Sea Islands. 2. How have the Gullah been able to keep their language and their traditions in tact? Thanks to their solidarity and relative isolation, the Gullah people were able to keep their language and traditions intact. The initial cause of this isolation was the African slaves’ hereditary resistance to diseases like malaria and yellow fever, which thrived on the rice plantations of the swampy coastal plains of Georgia and South Carolina, and their masters’ susceptibility to these diseases. As a result, white planters left their farms during the summer and autumn months, and slaves had little contact with whites on a day-to-day basis. 3. Have Gullah influences found their way into mainstream culture? 4. Although the Gullah are Christian, their beliefs deviate in one important aspect. What is it? Sea Islanders believe that when a person dies, his soul returns to God but his “spirit” stays on earth and carries on its day-to-day routine. It is the job of the living to see to it that these spirits are well cared for. One tradition is to decorate the grave of the deceased with the last articles that person used, such as bottles, pots, or medicines, each item purposely broken or rendered useless in order to symbolize the end of earthly things. This is common among people of central Africa, who historically honored the dead by placing valuable furniture, jewelry, and paintings on graves. 5. What is a “basket name”? Most Gullah-speaking people have an English name, to be used in school and with strangers, and a nickname, or “basket name,” typically of African origin. The basket name might be inspired by the season, month, day of the week, or time of the child’s birth; the conditions of the baby’s birth or the baby’s appearance at birth; or monarchs, places, animals, or even occupations. For more fascinating facts about the Gullah people, check out this What do you know about Gullah? trivia sheet.